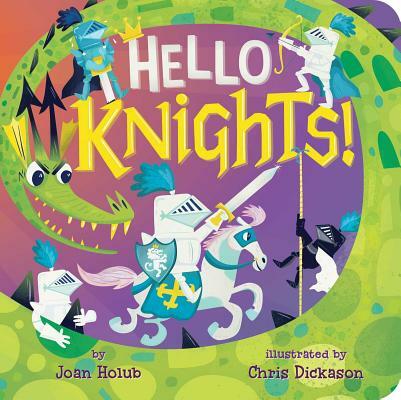 New from beloved author Joan Holub, Hello Knights! is a fun, playful board book about unexpected friendship! Take the queen her royal crown. Take the king his underwear. Perfect for reading out loud, Joan Holub’s hilarious text and Chris Dickason’s lively illustrations will have little ones huff-puff laughing as the knights and dragons run up and down the castle wall. A clever, interactive approach to first concepts, this board book series also introduces important “next-step” concepts like opposites in a hilariously engaging way. Chris Dickason grew up somewhere between the canals of southwest France, the Swiss mountains, England’s estuaries and amusement arcades. The youngest of four children (the ‘little brother’ role he still embraces in adulthood). Chris spent the majority of his education drawing on his friends’ schoolbooks and was brought up on a diet of Tom & Jerry, Swiss chocolates, cheap fizzy pop and French sunshine.